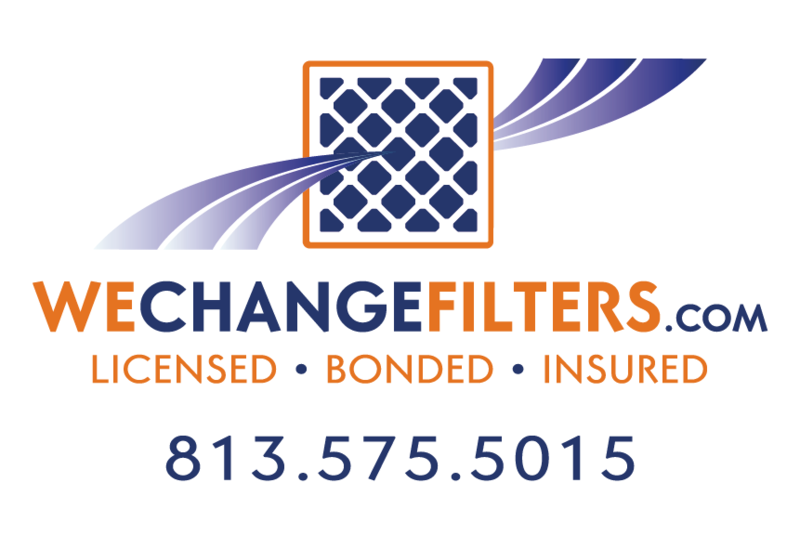 LUTZ – Fighting for their postseason lives, Steinbrenner faced off against Class 7A-District 7 rival Tampa Bay Tech but fell short 35-25 at home on Oct. 20. The Warriors (4-3) couldn’t bounce back from two early fumbles, and the running game stalled in the second half giving the Titans (4-3) the district win. Steinbrenner halfback Kendall Pearcey, who finished with 127 rushing yards and three touchdowns, led the way with an early 30 yard dash setting up the Warriors in scoring position. But Brian Gainer fumbled and Tampa Bay Tech defensive lineman Clifton Dilworth scooped it up and took it back for an 85 yard touchdown giving the Titans the early lead. After another fumble on Steinbrenner’s second drive, the Tech offense would sputter against a hungry Warrior defense. The Titans fumbled the ball away on their opening drive when Deon Thompson coughed up the rock and Steinbrenner’s A.J. Brown recovered. The Warriors answered midway through the first quarter after halfback Shaheem Barthel and Pearcey took turns driving the offense downfield. Pearcey capped off the drive with a touchdown, tying up the score 7-7. The Warriors took the lead on the first play of their next possession. Barthel took the handoff outside and it was off to the races as he went untouched for a 58-yard touchdown. Amiri Brown and Tyler McClain wrap-up a Tech running back. On the Titans’ ensuing possession, halfback Cludner Lacount paced the offense and drove the ball quickly downfield. Quarterback Aaron Midthus used his 6-foot-1, 190-pound frame to his advantage, calling his own number to reach the end zone on a quarterback sneak up the middle. The Warriors wouldn’t be deterred. Starting on their own 30-yard line, Pearcey put the team on his back with a 70-yard rush coming just one yard short of the pylon. After a penalty and loss of yards, the Warriors elected to go for it on fourth and goal. The gamble worked as Brown found a gap and stuffed it in for his first touchdown of the night giving Steinbrenner a 19-14 halftime lead after the 2-point conversion failed. 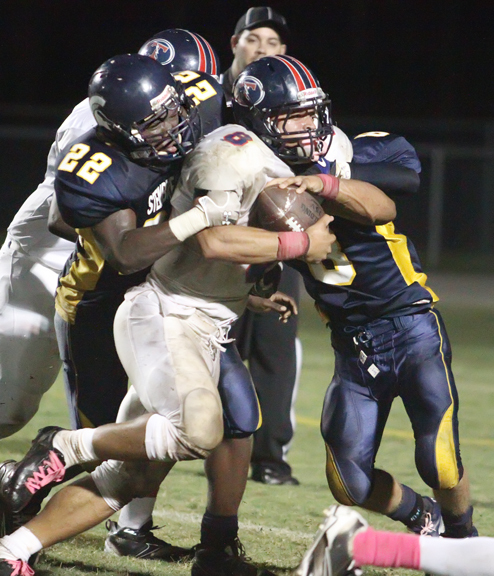 The Titans made key adjustments on defense in the second half that stalled the Steinbrenner offense for the remainder of the game. After trading a pair of three and outs, Tech found the offensive life it lacked in the first half. Midthus found Lacount deep for a 37-yard touchdown strike and a 21-19 lead that would not be surrendered. After a stifled drive by the Warriors, the Titans capitalized on a Steinbrenner mistake. Lamarq Caldwell found a seam in the tiring defense and set up Midthus’ second rushing touchdown of the night extending the lead to 28-19. Zack Jones fights off a defender on Steinbrenner's opening kickoff return. The lone bright spot for the Warriors in the second half was on the next kickoff. Pearcey received the kick at his own 15-yard line, but thanks to a couple of big blocks and a wide open lane, he turned on the jets and brought the Warriors back to within three points on an 85-yard return score late in the fourth quarter. The comeback attempt was short lived, as Tech ate up the clock with a constant dose of rushing. Caldwell drove the Titans 52 yards and set up his outside rush to the end zone giving the Titans the 35-25 win. 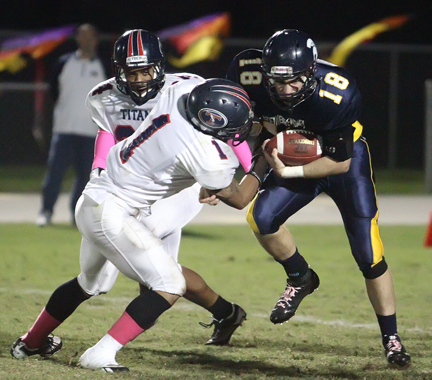 The loss ends Steinbrenner’s chance of making the playoffs for the first time in the program’s second full varsity season. The Warriors played a split junior varsity/varsity schedule in 2009. 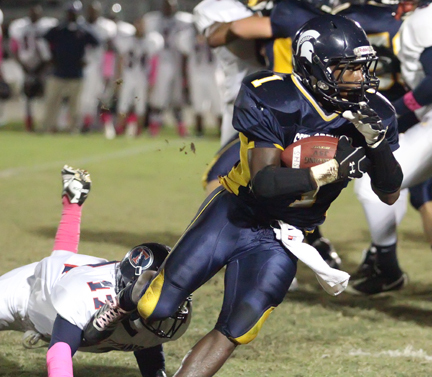 Steinbrenner travels to Wiregrass Ranch (0-7) on Friday, Oct. 28. Barthel says the team will play the final three games as hard as ever.